Thank you for all the great comments on this painting. This was a real learning effort for me, and I think it helped me push myself further in the right direction, and quickly too. I feel much more confident about my painting with the new year barely underway. Based on some comments, and with a thanks to David Tripp for asking specifically about the background, here’s a rundown of what paints I used and how I approached this. I used all the above colors except lemon yellow, in roughly this order. Step 2: Mix Prussian Blue and Verzino Violet to make a very dark, rich purple, and lay that on top. Step 5: To bring out darks I layered a mix of Prussian Blue and Perylene Maroon. 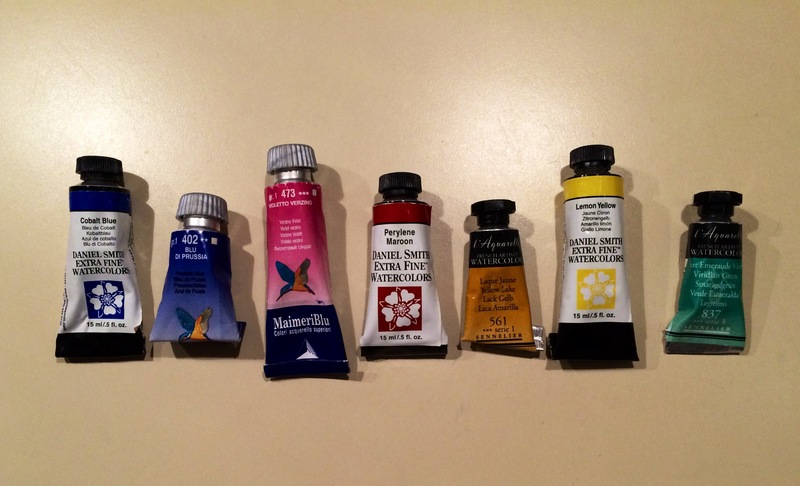 Steps 6-8: Some more Yellow Lake, Cobalt, and Viridian applied separately. I did this just to make sure I would have spots of colors in the background I would return to on the bird. Because those are mixes of staining and granulating paints, with each application there was some mild removal or displacement of some earlier layers. This is why I switch to the Neptune brush later on, and also why some color variation came through pretty well. The darkest darks were mixed with Prussian Blue and Perylene Maroon as the core colors, but had a few others mixed in to shift the mix. I tried to channel John Singer Sargent’s watercolor portrait work for the use of brushstrokes and color variations. For colors, I primarily used Perylene Maroon, Cobalt Blue, Prussian Blue, and Verzino Violet, accented with the other colors. I honestly can’t remember much about how I did this because I just had a few palette spaces going where I would just mix various colors in to shift the colors, so even if I say I mixed Cobalt Blue and Verzino Violet, there was other stuff in there toning down all the mixes and giving them harmony. 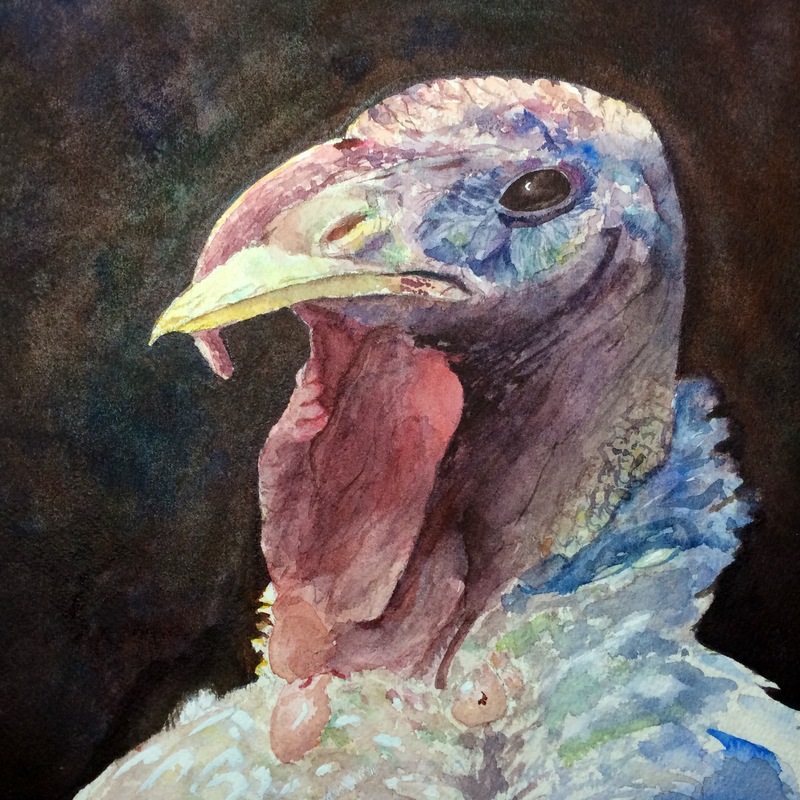 The turkey is pretty incredible for all the little color variations, and I tried to bring them out here. Throwing in spots of green and yellow was an important realization that I think make a big difference. This is essentially a “primary” color painting, with red, yellow, and blue factoring strongly. Adding some of the “fourth primary” (green) helped to balance it and add interest. At the very end I used some Titanium White gouache to bring out some highlights in the eye and on the feathers. Another nod to Sargent. For the marks on the paper, I wanted this to have the texture that would come from a mix of small washes and brush strokes. For the most part, I washed, removed with a towel, washed again to get some basic tones right (like the warm light under the chin), and then worked with brush strokes and little dabs and micro-washes of color on top. I had to decide on the most important areas to focus (around the eye, the warmth under the chin), and then make sure the rest worked with that. Thanks again for following along with me on this one. I have a few ideas to get started on for more paintings this week, so I hope to get at least some preliminary drawings up over the next few days. Turkey Palette–I really appreciate this photo. Like the ballet girls photo you gave me. Thank you for sharing what you used and how you. I like your use of color next to color. Nice Turkey!